olive and ollie: Are you ready for another giveaway?? Are you ready for another giveaway?? I hope so, because I've got another good one for you as part of the Quilting Gallery's Quilter's Blog Hop Party! And while you're here, don't forget to check out my other two giveaways that are going on right now: enter to win an AccuQuilt Go! Baby fabric cutting system and your choice of three dies and then enter to win a FQ stack of Robert Kaufman's Kona Cotton in the Grounded Color Story and a copy of Modern Log Cabin Quiting by Susan Beal. Fun! Todays' giveaway if a big goodie bag, stuffed to the brim with fabrics and notions, to get you crafting, sewing, quilting, and inspired! First up is a set of four fabrics from my personal stash that I've put together. Each is a one-yard cut, and I created this combination of reds, pinks, and greens for a holiday feeling, but it is also versatile enough to use year round as well. Included in this bundle are two prints by Maxfield & Pillow for Michael Miller and two prints by Tina Givens for Free Spirit. Next up are tons of these cute little sample sets of Moda fabrics. Aren't they adorable? I think these could make some really cute patchwork projects! There are a lot of good ones here, so take a look at some of them that are included in the set of fourteen. And next up are three sets of beautiful fabrics by Bernartex. There are some fat quarters and some charm squares. I especially love that typeface print! And a cute little ceramic thimble. Isn't that sweet yellow bird adorable? There's also a retractable tape measure in there too! And for even more inspiration, I'm including a dvd sampler of qnntv.com shows, with episodes of Quilty, Quilt Out Loud, Quilt It!, and Quilting Celebrations with Patrick Lose. **Leave a comment telling me what you'd like to make with some of the things in the goodie bag. That's it! The giveaway runs until December 17th, at midnight, EST. I'll use the Random Number Generator to pick one winner. International entries are welcome! 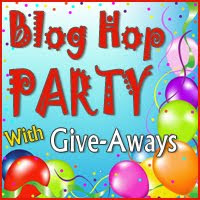 And be sure to check out all of the great giveaways that are part of The Quilting Gallery's Quilter's Blog Hop Party! What a great give away! I would love to make some doll quilts, baby quilts and potholders with those cute little bundles of fabrics. Thanks for the chance to win! I would definitely use the typeface fabric first. Perhaps for a few pillows. I am a follower of your fabulous blog. Thanks for the chance. I want to make something for myself- I've made so many gifts this year (almost finished with the list) that it's time to make something for me. I'll probably start with a new winter-but-not-Christmas mug rug for after the holidays, then make some new off-season place mats, then some new pillow covers for our couch. That should keep me busy for the first week of the new year! I"m a follower of your blog, too. Thanks for the chance to win such fun fabric treats! I would probably make a bag or two. And watch the DVD of course! I am a brand new follower of yours! Oh my goodness - there is so much there that it's hard to digest and think about what I would do with it all! But I like to quilt lap-sized quilts or larger more than I do any other types of sewing, so I would probably think of ways to work these fabrics into a nice-sized quilt - maybe for on my couch... I've been needing a good snuggly quilt for my couch. I'd like to make some patchwork bags and a couple of mug rugs. I am a follower of your blog. Thank you for the giveaway! So many possibilities, I wouldn’t even know where to begin. I would use the teeny charms for a scrappy-ish nine-patch that I’ve been wanting to make forever—no cutting! oh gosh, i have no idea, but those mini charm squares are just screaming hst to me so maybe i'd need to make a whole lot of triangles! How generous! My goal next year is a quilt for every niece and nephew so I would use it for those. I am a subscriber. Thanks for the opportunity. I have a mosaic quilt planned for a friend that requires lots of little pieces. These would be great! I follow on my reader. Thanks for the chance! I just signed up for your blog today, but I love what I see! I would love to make some book covers that I found recently and many of the fabrics would be perfect. And I'm also thinking some sort of tote bag for all those books. . .hmm. . . I'd definitely be making a patchwork quilt from those cute little squares! Thanks for the fun giveaway! SO many great goodies, THANKS for the chance! I really want to make some new table toppers for my kitchen and dining room. I could make my daughter plenty with the great giveaway. She has doll patterns picked out and a scrappy quilt comes to mind with the sampler squares. Oh wow, awesome giveaway! I'd try out this mini charm packs for patchwork pillows. Saw some beautiful ones on Red Pepper Quilts today, and I'm totally inspired. And I love typeface print! WOW! Thanks for the generous giveaway! I'd make a table runner and some quilt blocks. Merry Christmas! I am a follower of yours!!! hmm, i can see lots of potential projects from this stash. i'm in love with those cute little sample mini stacks. i'm in need of a new throw quilt for my downstairs couch. my kids requisitioned my old one for the entertainment room. those would be perfect. plus, i've got a handful of friends having babies in the spring and i would love to make some cute stroller quilts for them. i wish they sold those sample sizes, but then i guess they wouldn't be samples, huh? :-) thanks for the chance to win. Great giveaway! I would probably start with the little mini charm packs and make some little patchwork pillows or quilts. All of the fabrics are lovely and I am sure I could think of some fun things to do with every one. Thanks for the opportunity to win such an AWESOME prize package! The other fabrics look kind of masculine, so I might make something for ME! Something I have yet to do. I am of follower of your blog. I would make a table runner with the pink and green fabrics, maybe a couple patchwork bags with the little bundles, and some mug rugs with those bundles. What an awesome bag of goodies...I think I would use some of that to make some place mats and maybe tote bags...I love tote bags! Oh my! those mini sample packs are fantastic! they'd make great little patchworky things...probably pillows for my couch.. I'm a follower too..thanks for the giveaway! Oh, wow! I would love some tiny puffed squares from those samples. Something for my sewing chair! I would make something with the typeface first, I LOVE it. I also love those tiny samples for so many things. This has pillows written all over it. How cool! FUN! FUN! FUN! Thank you! I'm a follower too! :) Thanks again! I love using charm packs to make flowers! I am working on doll bedding, so these little squares would be perfect! I'm a follower through the RSS feed. Thank you for the giveaway! Those sample sized fabric packs are the cutest! I think I'd use those to make mini charm quilts, either plain squares or a tumbler shape. Thank you so much for the very generous giveaway! What a fantastic treasure trove of quilting goodness! Those mini charms are awesome! The idea of that size being precut really makes the idea of sewing with that size much more appealing. I would use them in a quilting project for sure ... as would I with the other beautiful fabrics in the bunch! Thanks for the chance to win! Oh my gosh! What a great goodie bag! I'd love to make a few baby quilts with matching doll quilts with all of those little Moda packs. Thanks for the chance to win. Of course I follow your blog! ...and I'm right here in Ohio. You would save on postage if I won. LOL. Thanks for the second chance for followers. A bag of fun, in any case! Great giveaway!! Wow thats an awesome give away. I really like all the mini charm packs. I think they would make some cute doll quilts! I am already a follower:) Love your blog. I follow on twitter & just added a google subscription. I would likely use the red, green and pinks for some new stockings. What a great giveaway! Thanks so much for hosting these! I love the typeface print! I think I would make some pillows for my bed with that. The little teeny charm packs are adorable! I am such a fabric hoarder! I love the little Moda sample blocks. so incredibly cute. Those would be awesome to make a little skirt or bag for my daughter. Thanks for the opportunity to win. Gorgoeus giveaway! I'm usually making big things, so those little swauares are perfect to practice new blocks on, maybe some doll quilts for the walls? And something for me of course. Im a follower of your blog, thank you! Lovely bunch of goodies! I'd give the pink and green and red fat quarters to my sister in law because she is collecting up those colors for a new quilt. The tiny charms would make wonderful little zip bags, which would make wonderful little gifts for birthdays and such next year. That type face print, I'd have to make something for me, maybe a tote, maybe a table runner. Such an assortment of wonderful things! You'll be making someone very happy! those charm packs would make cute patchwork to use for bags, pillows, or maybe even a quilt! That is a haul of a giveaway! I'd use all the mini charm packs paired with solids to make half square triangles and a scrappy quilt. i would be *thrilled* to win this package!! my 6 year old daughter is getting a sewing machine from Santa this year and a stocking full of those sweet charms would be awesome! i trust her with a sewing machine (with speed control) but a rotary cutter scares me!!! i follow your blog, and am inspired by your work! The mini charm packs are so cute! I think it might be time to put together a postage stamp quilt or perhaps a wall hanging. :) Thanks for the giveaway! I would love to make some pillows for my daughter's play room and maybe a postage stamp quilt! Thanks for the great giveaway! I am a new follower - I just signed up for your RSS feed! OMG!! I have been wanting some mini charm packs!! Perfect for my hexagon quilt! Thanks for the chance to win such an awesome goodie bag!! I love that Benartex fabric! I think I might make a pillow out of it. That is a really nice goodie bag. I think some table runners and a tote bag would be fun. Oh boy it's hard to decide what to make.There are so many pretty things in this give away. Wow, what a fabulous giveaway! I would definitely make some Christmas pillows with the fabrics that you included. Oh, I would make some aprons, mug rugs, or maybe a patchwork throw. Those mini samples would be perfect for my charm postage stamp quilt. Great give-away! Very generous giveaway! I've been wanting to make a lap quilt for myself and I think any of these fabrics would be great. Thanks for the chance! I would definitely make baby quilts and pillows and I don't know what else! Oh, what fun! Love those little charms, but I would definitely start with the pink and green, add some other fabrics and make myself a beautiful quilt, because that is my all time favourite colour combination. Wowzie, Zowzie, fabulous giveaway! I am really drawn to sewing quilts with small pieces. I can see myself using the little samplers first, just because of the sizes. They would make great bags maybe? Hard to tell the size. Thanks for a chance to win. Such an amazing array of goodies, WOW! The yardage in reds, pinks & greens would make some lovely pillows & might stretch to a patchwork tote as well. The moda sample packs are gorgeous & would be lovely in throw quilt or 2 or 3! Thanks so much for a lovely & generous giveaway. I'm a very happy follower, thanks again Heather. ^What a great giveaway. Thak you so much! I would have to go for the patchwork project. I have a drea friend about to have a baby and I would go for the crib quilt! I need to make a baby quilt for Margaret's Hope Chest - they send them to prenatal classes to 'bribe' the moms to attend!! I follow you every day - so much fun!!! I love those mini packs - great for postage stamp quilts. I love the tiny charms - I'm happily making mini quilts at the moment,these would be perfect! You are a most generous gifter! I am a first time visitor, but will subscribe as soon as I leave this comment. I would make a bag of some kind. I have about 6 patterns that I've been hoping to get to and now that Christmas gift making is complete, I'm ready. Ooo, what a giveaway! I am so thrilled by this staff, because there is now such a beautiful fabrics where I live! That is one amazing giveaway. I'm thinking some fun placemats from the mini charms. What a awesome goodie bag and giveaway! I would make runners and a baby quilt, thanks for a chance to win! I am a follower of your neat blog, thanks! I would make some cute little purses out of the mini packs. I would love to piece together some drawstring bags from the mini charm packs. So cute! Holy cow!! I think some doll quilts would be in the making. I also think the mini charms look like they'd make lovely accent strips on some pillowcases. WOW! Yardage and precuts. I would like to make a new quilt and possibly some stuffies. Thanks for the chance to win. Oh pick me! What would I make? A quilt of course! Thanks for the offer! We'll do I follow? I get your emails. I'll have to see if I signed up to follow! But I will. I love getting emails so I know when to come and visit! I love this giveaway! I am new to quilting so I love pre-cut packs - it makes it so much easier for me to get started. I would love to make a four patch quilt with them. WOWZERS....what a giveaway!!! I would have to start making more quilts for sure. I would love to make quilts for the ladies in my family, especially my grandmother since she taught me how to sew!! The pink and green will blend nicely with my stash. I'm imagining a postage stamp quilt with the little squares - or maybe zillions of little pinwheels. I would love to make a postage stamp quilt, and these would be perfect. What an absolutely beautiful giveaway, you are so generous, thank you!! I am a follower through email: I love hearing from you every day!! What a wonderfull giveaway ! I don't know yet what I'll make ... Play with the little squares, sure ! What woult I like to make? Quiltquiltsquilts and eh...quilts. So much great fabric in your give away. Thanks for the change to win! I am busy bloghopping now. I am a participant too, so you might visit my blog too! Kind greetings from the Netherlands. It seems like a party with all these give-away's!I'd love to make a doll quilt for my new neices. I've never made one. And that gorgeous type face fabric I'd use for the black and white quilt I'm making myself. Thanks! I think I would like to make a few tablerunners with those lovely charms. Perhaps even with hexagons! I am a follower of yur blog! I'd make pillows for the living room and then quilt! I'd love to make a baby quilt to put in my I'm gonna be a Nana someday bag.. not too soon, but someday. This is so much fun and your giveaway is so delightful. I would make some toss pillows with the pink and greens and a little quilt for a niece with the Moda squares, the typeface fabric would be a gift to a friend that is into letters. Those sample sets would be just perfect for a hexagon project. I love doing hexagons, and you can see some of my things on Flickr; tubakk-quilt, and of course also in my blog. Thank you very much for a chance to win! For sure I'd use those little sample squares for a Cathedral Windows quilt. The rest I'd have to hoard for a while until the perfect project came along. A little hoarding's okay? Right? I'm a follower as well, thanks for the give away goodness! Especially love that typeface print, would look good in a quilt! its more like what couldn't i make you are very generous! I became a subscriber to your blog. So many things to make, potholders, oven mitts, a bag or two. That is a lot of goodies to get! LOVE the yard pieces of fabric. Would make a nice pillow, or small wallhanging to coordinate together. My brain is spinning with projects. Certainly blocks I haven't tried, totes, pouches folded star sofa pillows. I could go on and on. Wow, those goodies look wonderful! I love making table runners to give as gifts and some of those small cuts of fabric would be perfect for small projects. Thanks for the chance to win! I would make lots of quilts. Especially for a new grandbaby that's expected in 2012. Thanks. wow that's a nice bag of loot! Those petites are super cute so I would love to make a patchwork quilt with them! Thanks! The little squares would make lovely table runners, either to keep or for gifts. Thanks for a really generous giveaway. I follow your blog and love it. Thanks for the chance!! This giveaway is so great! I would use the little squares first - my 8-year old daughter is asking me to make her a quilt for her birthday, and she would love a scrappy, bright quilt. Thanks for the giveaway! I love love love the typeface fabric!! oh the possibilities, but i think i would love to make a pretty quilt with all those squares!! nice and colorful!! thanks for the chance!! and love you blog! i am also a follower of your blog!! What a generous giveaway!! I think I see a summer bag out of the pink/green selection. Some doll quilts from the mini squares and maybe pillows from the rest! Wow-wee! I have never seen such a fantastic prize!! I think I would just covet the typeface fabric for a little while because of its gorgeousness. The little sample packs would be great for farmers wives blocks. Thanks for the chance to win! I'm a follower too. This comp is being drawn on my 40th birthday so maybe the stars will align for me!! I'm hoping my daughter is having a girl, and then those fabrics will be put into a quilt for the new precious baby! Ican hardly wait...she's due in April and her apt to find out is this month some time...waiting on the edge of my seat! this is the first time I see those tiny charms...I think I'd use them up in a scrappy irish chain...that has been in my to do list for way too long! I just signed up for the email posts. I didn't see the google follow widget? I'll be a more faithful reader if it comes in email form anyway though. I would love to make a table runner from those gorgeous pink and green fabrics, and some little mug rugs from the samples....aren't they just gorgeous.